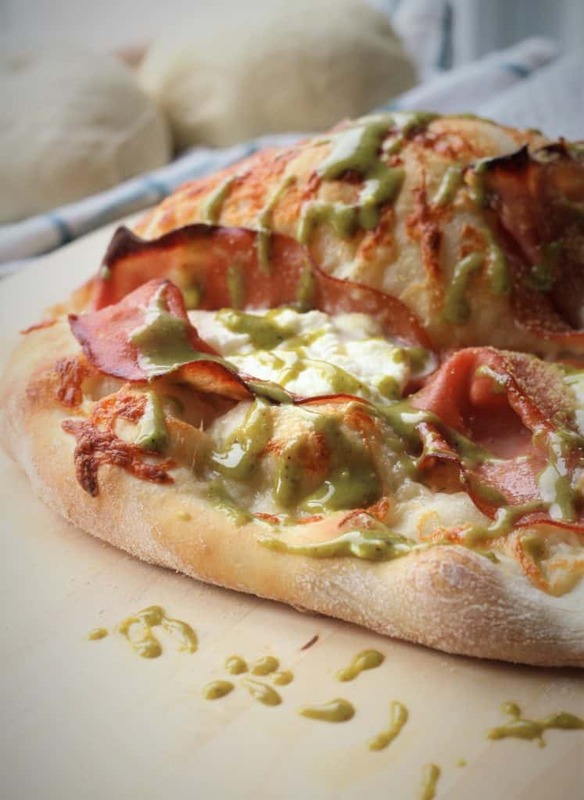 Mortadella, Ricotta and Pistachio Pesto Pizza, three simple ingredients combined on pizza that perfectly complement one another to create one of the best pizzas you’ve ever tasted! I have found my new favorite pizza! 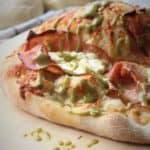 I had the opportunity to try a Mortadella, Ricotta and Pistachio Pesto Pizza at a local pizzeria with my daughter a few weeks ago. It was love at first bite for both of us. Sorry arugula and prosciutto pizza! In case you were not yet aware, my family and I love pizza. So much that, at my son’s request, we purchased a wood burning pizza oven a few years ago. Given our arctic like climate, it’s a portable oven that we store away in the garage for the winter. In fact, I’m counting the days until the snow melts completely so we can take it out of hibernation! You can read all about it in my Pizza Party post. 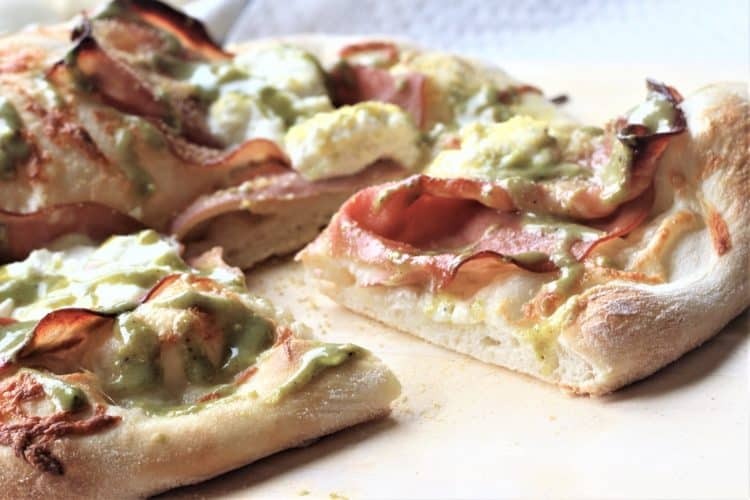 Back to Mortadella, Ricotta and Pistachio Pizza! First of all, it has ricotta on it. Check! Then that pistachio pesto drizzled all over it! I’m so enjoying cooking and baking with pistachios since I purchased my chopped pistachios in Sicily last summer. So far I’ve made Pistachio Amaretti; Sicilian Veal Involtini; and Sicilian Pistachio and Nutella Cake. This recipe gave me the opportunity to use the last of them to make pesto. Bittersweet indeed! But I guess I’ll have to go back to Sicily to restock. And finally there’s the mortadella which until now has been my least favorite type of cold cut. However, baked onto this pizza dough, topped with ricotta and drizzled with pistachio pesto, it’s a combination made in heaven. 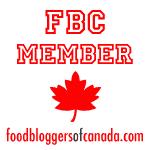 I also need to share with you my all about my experimenting with pizza dough. Last weekend while making Sicilian Sfincione, I happened to make an extra dough but did not get a chance to bake it. It sat in my fridge for four days before I had time to prepare this pizza. I had long ago read that keeping pizza dough in the refrigerator for several days (and even up to 2 weeks!) improves the flavor and texture of pizza. But I had not had a chance to try it out until now. When I first took the dough out of the fridge that morning, I must tell you, the odor was incredibly strong. I thought surely something went wrong. But I decided I had nothing to lose, I may as well try baking it. The result was incredible. Light, airy and slightly crisp dough with a wonderful yeasty flavor. Everyone in my family agreed it was the best dough I had ever made! Let me share with you how I prepared this wonderful pizza! I made my dough using the same recipe as that of my Sfincione Siciliano. It proofed at room temperature, as usual, for 2 hours. I then placed it in the fridge for 4 days. On the morning of the day I planned on baking it, I removed it from the fridge about 5 hours prior to baking. 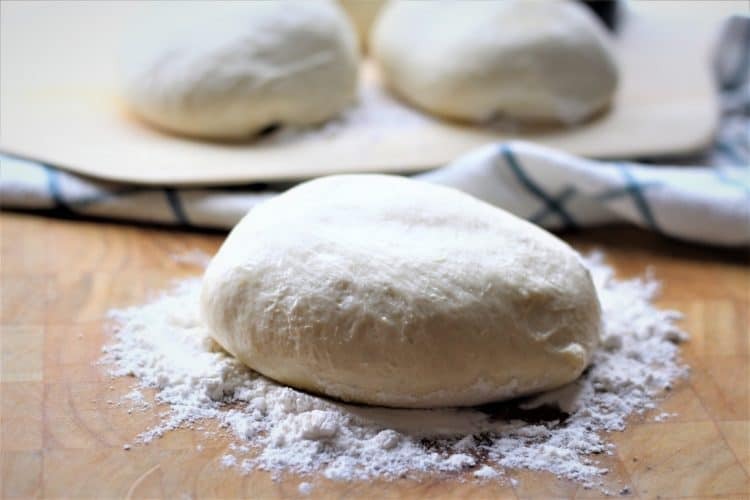 Most recipes specify that removing the dough from the fridge about 2 hours prior to baking in order to bring it to room temperature is enough. However, I’ve always found the dough too cold after only 2 hours. When the dough comes to room temperature, punch it down, divide it into 4 portions and shape into balls. Let it rest for one more hour before flattening each dough ball into an approximate 9 inch circle. I used my pizza stone to bake each pizza individually. This involved preheating the oven at 500F with the pizza stone in the oven for about 45 minutes. Place the flattened dough on a pizza peel lightly dusted with corn flour. 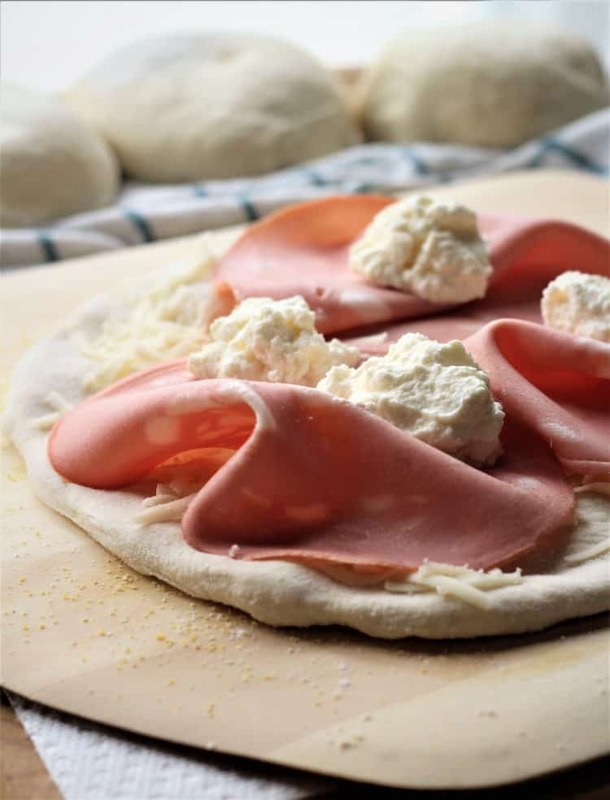 Cover each pizza with 1/2 cup shredded mozzarella and then top with 3 slices of mortadella. Finally, add 4 dollops (approximately 1 tbsp each) of fresh ricotta on the mortadella. Carefully slide the pizza onto the hot pizza stone, and bake each pizza for 6-7 minutes. Right out of the oven, drizzle each pizza with about 2 tsp of freshly made pistachio pesto. 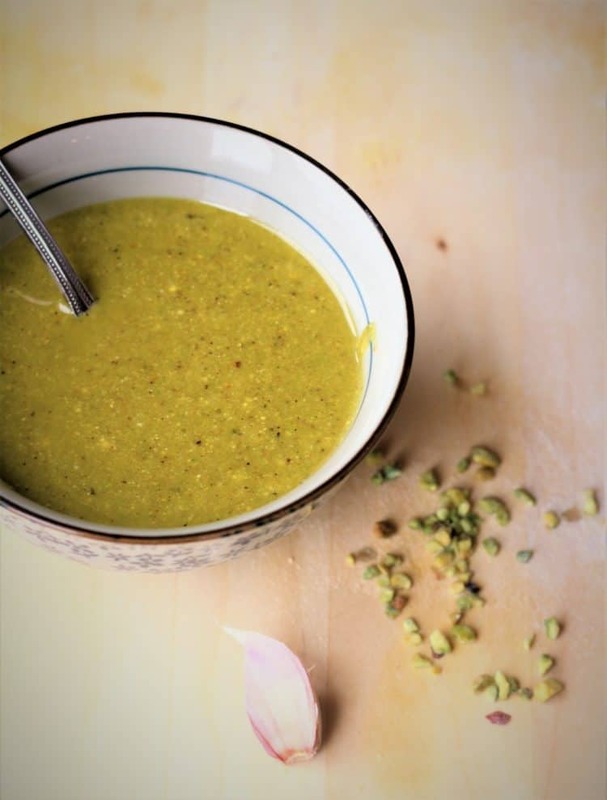 Just like regular basil pesto, making pistachio pesto requires 4 ingredients and a food processor or blender. Blend 1/2 cup chopped pistachios; 1/4 cup olive oil; 1 small garlic clove; 2 tbsp pecorino romano cheese and a dash of salt until smooth. That’s it! If you don’t use all the pesto for your pizza, keep in a glass container in the refrigerator for up to 1 week. Otherwise, freeze it in a freezer bag or ice cube tray until it’s time to make pizza again. You can also enjoy this pesto with pasta. That’s all there is to making this simple pizza. Impress your family and friends with this unexpected topping combination! Let me know if you give it a try by tagging me with your photos with @mangiabedda or #mangiabedda on Facebook or Instagram. Don’t forget to save the pin for later. Buon appetito! 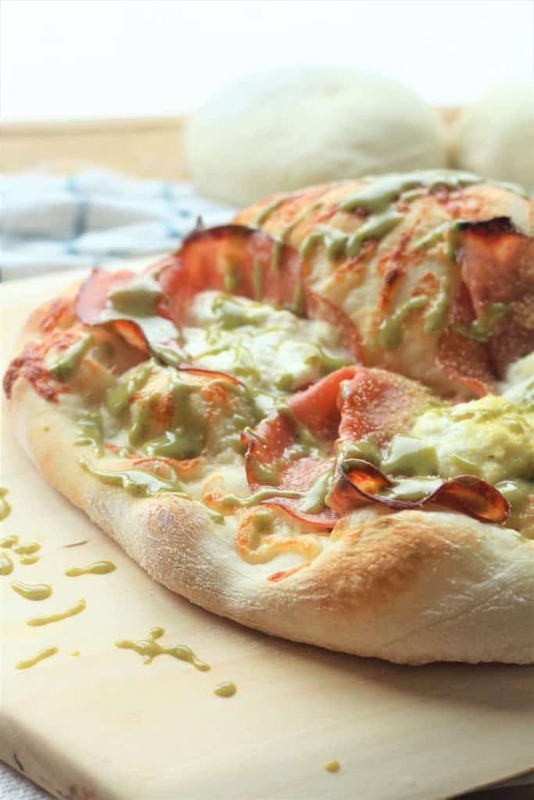 Mortadella, Ricotta and Pistachio Pesto Pizza, these three ingredients are a match made in heaven on pizza! In a small sauce pan, warm the water until tepid. Place the yeast in a small bowl and cover with warmed water. Let sit for 10 minutes. In the bowl of a stand mixer fitted with a dough hook, combine the flour and salt. When the yeast is ready, stir in the olive oil and sugar. With the mixer running on low, pour the yeast mixture into the flour. Mix until combined. Switch to medium speed and knead the dough for 10 minutes until smooth and elastic. If necessary, knead by hand for a few minutes. Place the dough in a greased bowl, turning to coat all sides. Cover in plastic wrap and let rise until doubled in bulk, about two hours. After the dough has risen, punch down and divide into 4 balls. Let sit for 1 hour. Meanwhile, prepare the pistachio pesto by adding all ingredients to your food processor or blender. Purée until smooth. Preheat oven to 500F and place your pizza stone in the oven while preheating. Heat for about 45 minutes or up to an hour. Lightly dust a pizza peel with corn flour. 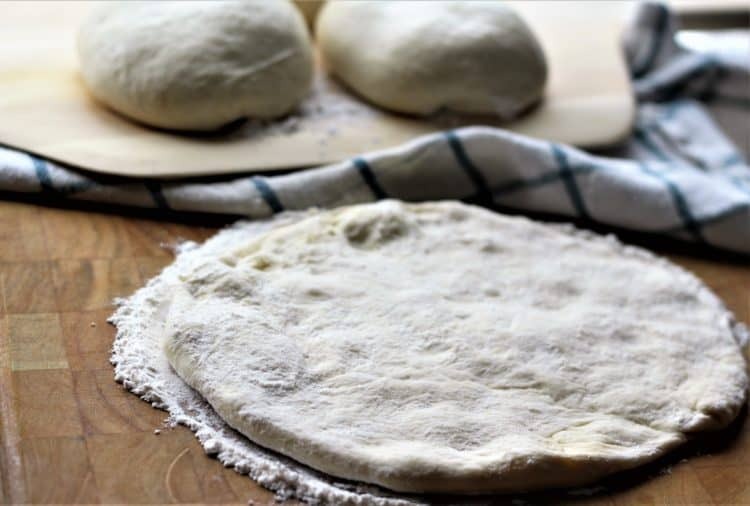 On a floured surface, use your finger tips to flatten each dough ball into an approximate 9 inch circle. Sprinkle the dough with 1/2 cup shredded mozzarella. Top with 3 slices mortadella. Add 4 dollops of ricotta on the mortadella. Carefully slide the pizza onto the heated pizza stone and bake for 6 minutes until the dough is golden on top as well as underneath. Remove from oven and drizzle with pistachio pesto. Serve hot. Store unused pistachio pesto in a glass container in the refrigerator for up to 1 week. Alternately, you can freeze it in a freezer bag or ice cube tray. Please note that nutritional information provided is approximate and may vary according to exact portion size.